The kayak pavilion at Long Dock Park. Photo: Robert Rodriguez, Jr.
Beacon, Dutchess County (19 acres)—A critical 19th-century transportation link between New England and points west, Long Dock once contained a rail ferry terminal, warehouses and other buildings. More recently, it was home to an oil terminal, salt-storage facility and junkyard. 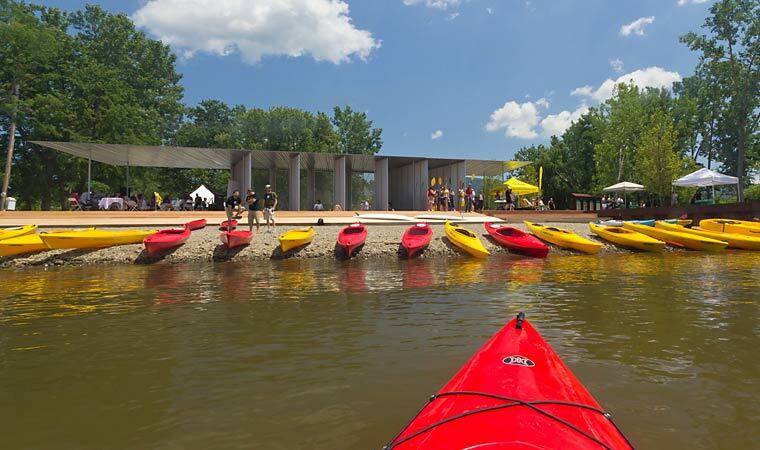 All traces of its industrial past have been removed to create an exciting riverfront destination boasting a kayak pavilion and beach for launching boats, rehabilitated wetlands and meadows that attract wildlife, a river overlook deck and a shaded plaza for informal dining. The park's restored, historic red barn, now Scenic Hudson's River Center, hosts arts and environmental-education activities. Bicycle rentals are available Thursday through Sunday from Cold Spring Bike Rental & Tours. One of the most popular attractions in the park, at Long Dock's tip, is Beacon Point, a shoreline installation by renowned artist George Trakas. The work projects out over the river (at high tide, water actually flows through it), making this a perfect place to fish, sunbathe and admire magnificent vistas of Newburgh Bay and the Hudson Highlands. The deck beneath and surrounding the kayak and canoe pavilion at Scenic Hudson’s Long Dock Park in Beacon has suffered some damage in recent years and needs to be repaired. Construction began in early April and should be completed by July 1. The storage pavilion will be closed while the repair work is underway, but the beach will still be accessible except at high tide. All other areas of Long Dock Park are open, including the recently completed North Shore. During construction, Mountain Tops Outfitters will continue to offer kayak rentals from 144 Main Street in Beacon. Reservations are required 24 hours in advance to confirm availability. Call (845) 831-1997 (Mon.-Sat. 11a–6 p, Sun. 11a–5p). Thank you for your patience as we make these important improvements. If you would like to be alerted via email when lottery registration opens, please fill out this form. 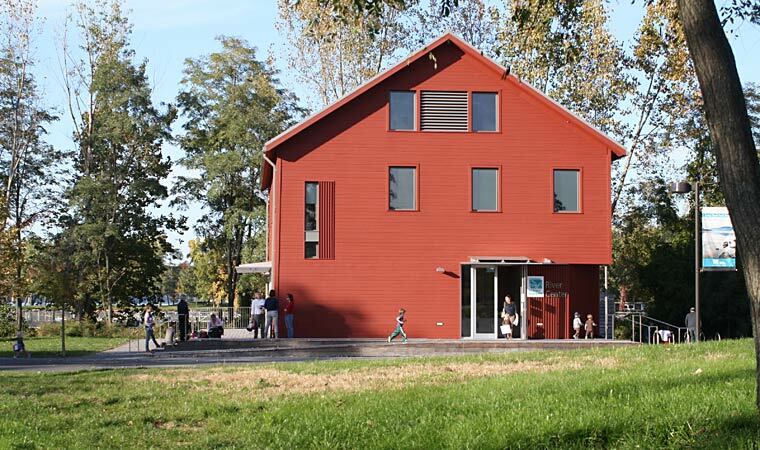 A historic barn at Long Dock Park has been transformed into Scenic Hudson’s River Center, which offers arts and environmental education programs. Universally accessible walking paths connect the park's myriad amenities. 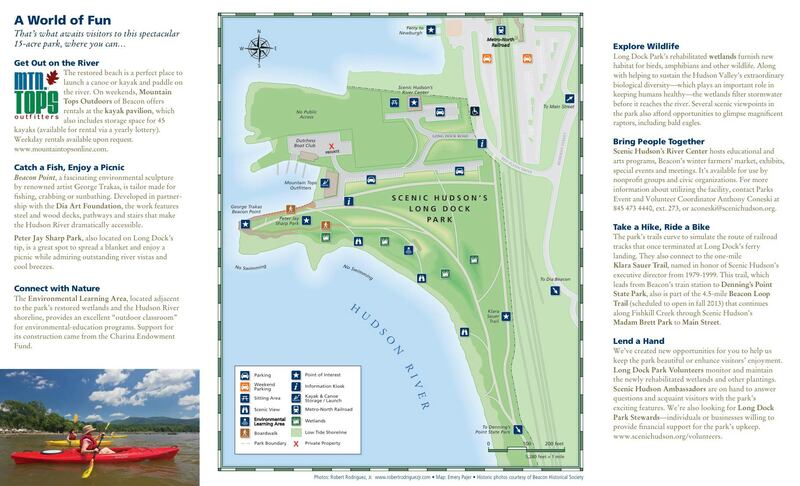 There also is a link to the 1-mile Klara Sauer Trail (named for Scenic Hudson's former president), which spans the waterfront from the Beacon train station to Denning's Point State Park. Dia:Beacon is a short walk uphill from the park. PLEASE NOTE: The Denning's Point bridge is closed of construction as of February, 2017. Park visitors using the Klara Sauer Trail should adjust their route accordingly. Nov. 1–March 13 6:30 p.m.
March 14–Memorial Day 8 p.m.
Memorial Day–Labor Day 9 p.m.
Labor Day–Oct. 31 7:30 p.m.
From Newburgh-Beacon Bridge, go 1.8 miles south on Route 9D, right on Beekman St., right on Red Flynn Drive then immediate left on Long Dock Rd.